With the development of economic globalization and trade liberalization in the world, the global industrial chain division system and value chain will be rebuilt; the interests of all nations are deeply blended; the multilateral win-win cooperation mode has been gradually become a consensus of the international community. Conforming to the tide of globalization and being the core driver of the new round of industrial revolution——intelligent manufacturing is prospering around the world. Intelligent manufacturing is the integration of science and industry. This combination requires people from different fields and industries to unite via interconnection & interoperability, information sharing, and integration & development to realize all-win. The 16th China International Machine Tool Show (CIMT2019), on April 15-20, 2019, is themed as “Win the Smart Future Together”, which fully fits the background of the current world economic development, and highlights the manufacturing industry’s current characteristics and future development trend in China and even the whole world. Made in China 2025, US Industry of Internet and German Industry 4.0 are pushing intelligent manufacturing to the center of the new round of industrial revolution. In the era of global manufacturing industry jointly towards intelligent manufacturing, machine tool manufacturing industry as the mother machine will quicken its tempo in the forefront. In the exploration of intelligent machine tool by the industry, it cannot go forward without the involvement of various disciplines and production-college-research-application cooperation entities. Sharing experience, information, knowledge and path of solving problems from multi-party are necessary condition for the development of intelligent machine tools. CMTBA (China Machine Tool & Tool Builders’ Association), as the most influential service organization in China's machine tool manufacturing industry, adhering to the principle of integration and win-win development of the industry to keep in-depth communication, broader cooperation, actively tries to explore internet communication protocol & standards, construction of the internet platform, with various machine tool associations and relevant trade organizations in the world for many years to contribute to the development of intelligent machine tool. China International Machine Tool Show (CIMT) hosted by CMTBA as one of the four most renowned global machine tool exhibitions, is also a global exhibition platform with the concept of integration and open-up. 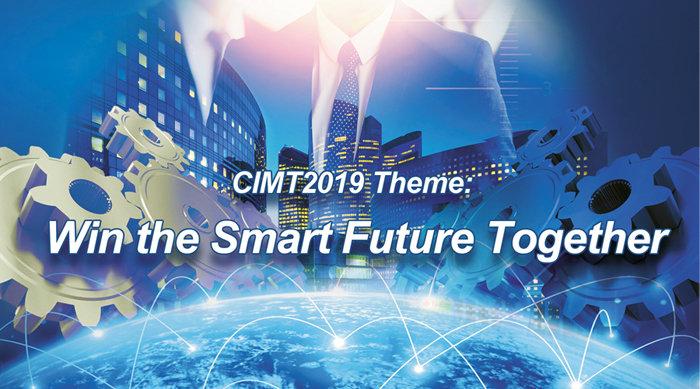 CIMT2019 will suit the background of times to serve domestic & overseas economies and technology, manifesting the thought of vast platform. There is convergence among exhibitors from overseas and at home, machine tool enterprises and customers, main machine manufacturers and parts makers, production-college-research-application inside the industry and collaborative innovation on the said platform. All coherence points of convergence could be found at CIMT2019. In terms of extensive scope, all previous sessions of CIMT utterly demonstrated the desire of China’s machine tool industry to expand its communication with the peer industry worldwide. China’s market is open and its innovation system is also open. With the irreversible tide of economic globalization, integrated development is the most sensible and suitable route to the advancement of the industry and even the world economy. Highly efficient integrated development would eventually bring about a favorable multilateral win-win situation. Intelligent manufacturing is the outcome of deep integration of manufacturing industry and information technology. Its birth and evolvement are concomitant with the development of information technology: from the mid-20th century to the mid-1990s, digitized manufacturing came into being by informatization characterized by calculation, perception, communication and control. Since the mid-1990s, informatization featured by large-scale popularization and application of internet brought life to digitized and network-based manufacturing. Recently, digital technologies such as Big Data, Cloud Computing, Artificial Intelligence, Block chain, etc. have been swiftly changing competition logic in traditional industry, prompting and realizing group breakthroughs and integrated application. A new AI manufacturing will appear by the deep integration of new AI technology and advanced manufacturing technology. Today, intelligent manufacturing as a guide to future manufacturing has been a consensus in the industry globally. Over the past decades, machine tool industry perfectly combined with machine tool digital technology to provide the global manufacturing with the most advanced manufacturing equipment - CNC machine tool. With the integrated application of AI, the new generation of intelligent machine tool will be of wisdom functions of self-perception, self-study, self-decision making, self-execution etc. to maximally raise quality, process optimization, health security and production management, etc.. Being the mother machine of manufacturing industry, the degree of intelligence of machine tool will have great influence towards the implementation of AI manufacturing. The new intelligent machine tool is bound to bring new changes to manufacturing, so as to become a crucial element to lead future manufacturing in the new round of industrial revolution. CIMT2019 will adequately illuminate the most cutting-edge technology and the latest achievement of intelligent development in machine tool manufacturing. From classic digitized solution to a new generation of products and technologies with intelligent manufacturing traits, the show will feast visitors with infinite creativity of intelligent manufacturing times, imagination and inspiration in leading countless possibilities of future manufacturing. With the joint efforts of global peers in manufacturing, we strive to boost the new generation of intelligent manufacturing to promote a fresh industrial revolution to better serve humanity to jointly embrace the smart future!